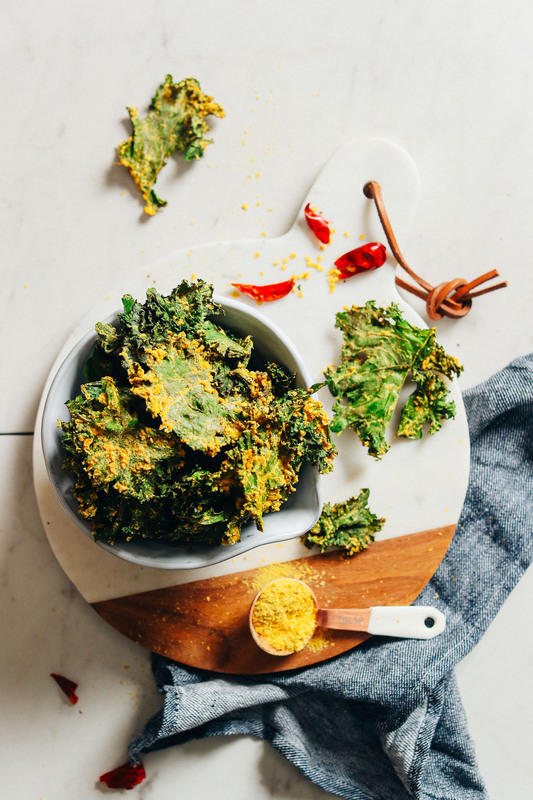 If you’re into kale chips, this is definitely a variation you need to try! It requires simple methods and 7 wholesome ingredients, and it yields BIG flavor. Let’s do this! The base for this recipe is a cheesy sauce made with sunflower seeds, nutritional yeast, lemon juice, and a few extra seasonings. The sunflower seeds are soaked then blended so this creamy goodness can coat the kale and help it crisp up (into chips – duh). The key to the coating process is to have the kale thoroughly coated but avoid areas of serious clump! 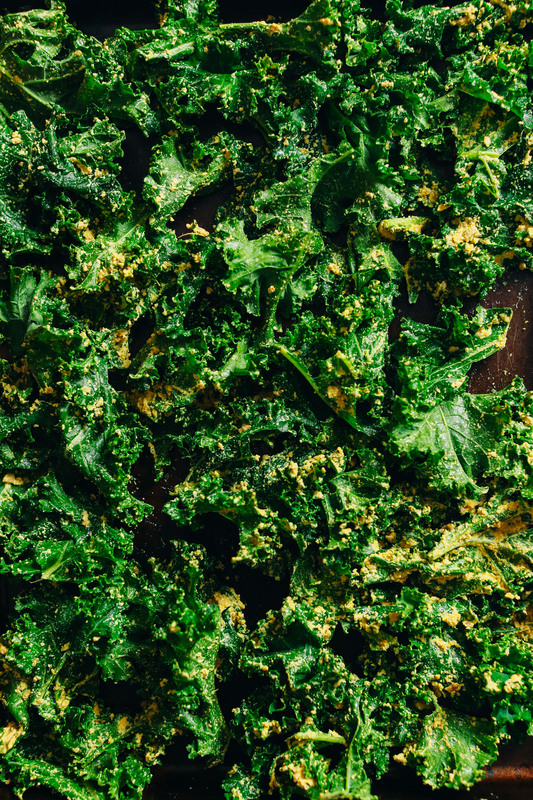 If you have any kale with a lot of the seasoning, it can have a tendency to remain a little tender after baking (which is not what we want). So coat, spread, and remove any excess. Then bake! This would make the perfect snack to have on a lazy day at home or if you’ve made a dip and want something healthy to go along with it (think 5-Minute Macadamia Nut Cheese, Easy Red Salsa, Garlicky Guac, or Lentil Dip). If you’re into kale, you’ll also like this version of Cheesy Kale Chips or this Kale Salad with Crispy Chickpeas. And don’t forget my Kale Chip Nachos, Loaded Kale Salad, Hide Your Kale Smoothie, and Easy Asian Kale Salad! 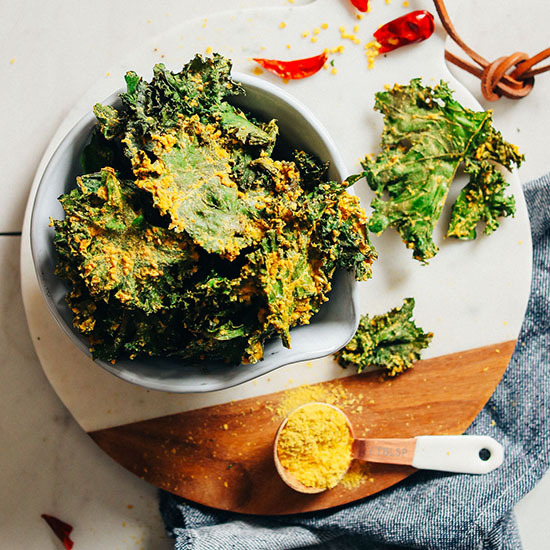 Amazingly cheesy, crispy kale chips baked in a sunflower seed-nutritional yeast coating! Healthy, simple ingredients, BIG flavor and nutrients! Soak sunflower seeds and then drain thoroughly. 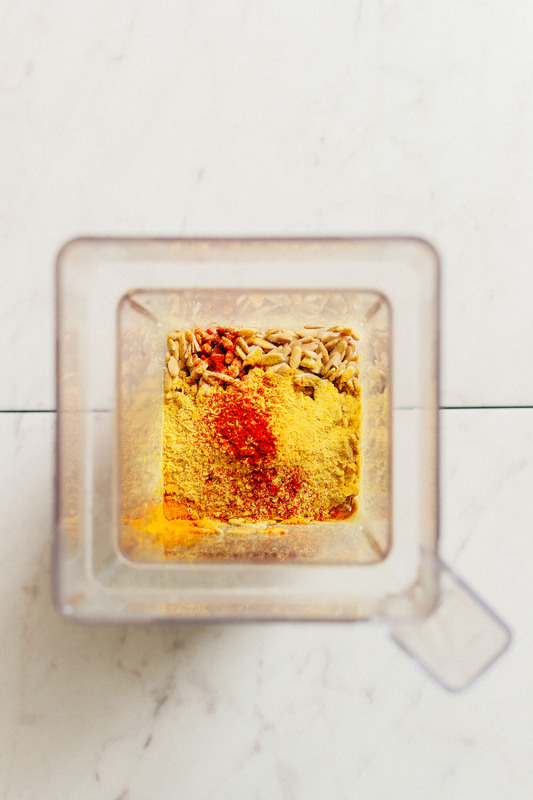 Then add to a high-speed blender along with lemon juice, nutritional yeast, ground turmeric, sea salt, cayenne pepper, and water. Blend on high until creamy and smooth. Then taste and adjust flavor as needed, adding more spices for overall flavor, nutritional yeast for cheesiness, or lemon juice for acidity. Preheat oven to 225 degrees F (107 C). Use convection bake if you have it to speed cooking time and help chips crisp up even more. Place parchment paper on two large baking sheets to prevent sticking. Set aside. Rinse and thoroughly dry kale. Then tear into small pieces and discard any large stems (they won't crisp well). Add to a large mixing bowl and add the sunflower mixture. Toss thoroughly to combine, using hands to distribute the seasonings evenly. 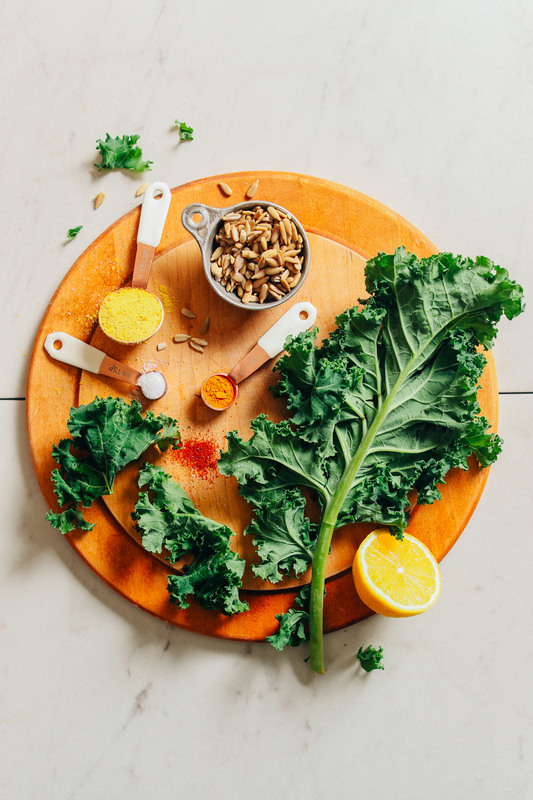 If possible, try and massage well enough to avoid large clumps of sauce on the kale or they may have trouble crisping up. 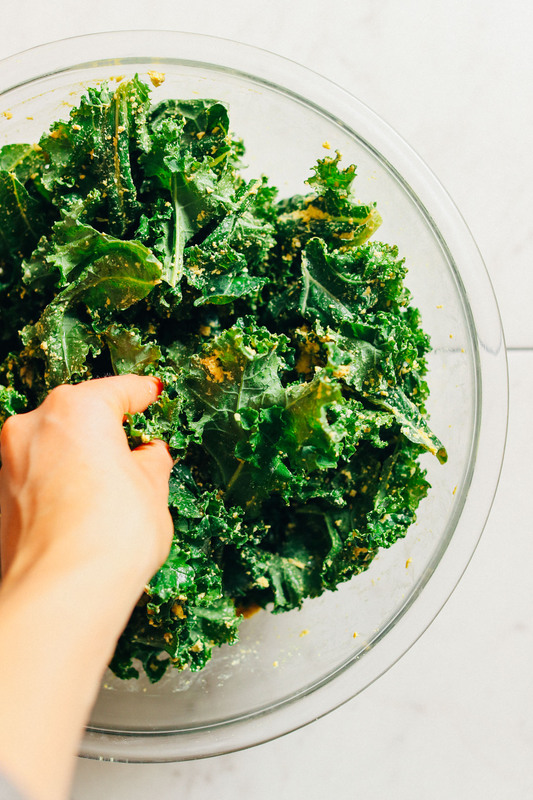 Spread the kale over the parchment-lined baking sheets, ensuring that the kale touches as little as possible to help crisp while baking. Depending on size of baking sheets, you may need to do this in several batches. The important thing is to make sure the kale isn’t overlapping. Bake for 20 minutes. Then turn the pans around and lightly toss/stir kale to ensure even baking. Bake for 10-20 minutes more or until kale is crispy and very slightly golden brown. If some of the chips are still wet with the seasoning, you can leave the pans in the oven a little longer at 200 F (93 C) to further dry / crisp up. Remove from oven and let cool completely - chips will crisp up even more once out of the oven. Enjoy immediately! Best when fresh, although you can loosely cover leftovers (try not to seal) at room temperature for 2-3 days. *I haven't tried testing this recipe with other nuts or seeds, so if you try it, let me know how it goes! We haven’t tried that, but it might work! The flavor may be a little more earthy though! If you give it a try, we would love to hear how it goes. I just made these and through in a few jalepenos I needed to use up… so tasty! My husband was surprised by how good they were and ate a whole plate. I split this on to two pans and had to do 2 rounds, but I should have done 3 to crisp them up faster. They taste best right out of the oven! I tried this with collards (had about 4 bunches worth from the garden), and they turned out great! Awesome! Glad to hear that, Becca! A few weeks ago I discovered dehydrated onion chips with a sunflower, maple and smokey coating. They are crazy delicious and very rich. I really want to start making them for my clients…glad to see the sunflower seed idea on other foods so I’m sure it works. I just made these and the flavor is amazing! I used home grown kale and the leaves were very small and tender. A lot of mine stuck to the baking sheet! Did I miss a step or should I be using much more stout kale? If they stuck, a baking mat or parchment paper can be helpful, but that shouldn’t have been the case with these. I just made these with pepitas in place of the sunflower seeds and it totally worked out just fine. I ended up soaking the pepitas for about 2 hours (making sure the water was hot the entire time) because they are larger than sunflower seeds and I also baked them a bit longer due to the pepitas being a little hardier and holding more moisture. Anything with nooch warms my heart so I am really enjoying these. Great recipe! I made these last night but totally missed the memo on removing the excess seasoning. After baking for 30 minutes and realizing they were not even a little bit crispy, I broiled them at 500F for an additional 8-10 minutes. Some outer pieces did burn (my dog was being cute so I got distracted) but they were a super yummy cheesy delicious treat! Made these tonight and they are amazing!! I didn’t expect anything less than amazing since every one of your recipes I’ve tried has gone into my ‘favorite recipes’. Love everything about your site and recipes. So kind – thanks Janelle! I found that, even using my Vitamix, the ratio you have did not blend smoothly. I added probably twice as much water & it still wasn’t blending very well. But I finally just called it “good enough.” I seasoned with additional freshly ground pepper & salt once on the baking tray pre-oven. These are tasty! Not sure I’d go to the extra trouble of dealing with the blender & seeds as opposed to just doing regular kale chips with seasoning next time but i’m glad I tried them & they do taste good. Thanks again, Dana! Sometimes the vitamix – depending on the model – does not blend things well, especially in smaller quantities. There’s just not enough volume and it kicks up the sides. Hopefully it still came together for you! Hi Dana, what kind of blender do u use? This site and emails are amazing. It’s mind opening to the many possibilities of plant based food. All delicious recipes. i have passed on the details to my vegan friends. Brilliant! Thanks for the love, Antonella! Mmmmh, I like the sound of these. It’s nice to see sunflower seeds rather than cashews in a kale chip recipe because the former are cheaper in organic quality. Hoping I’ll still be able to find fresh kale around here (seasonal for us so only available for a short period of time). Thanks for the note, Sara! Hi Sara! Thanks for reaching out. Mind sending us an email to support@minimalistbaker.com with a bit more info? We’d love to chat. Thanks! Hi Dana, Kale is my fav. 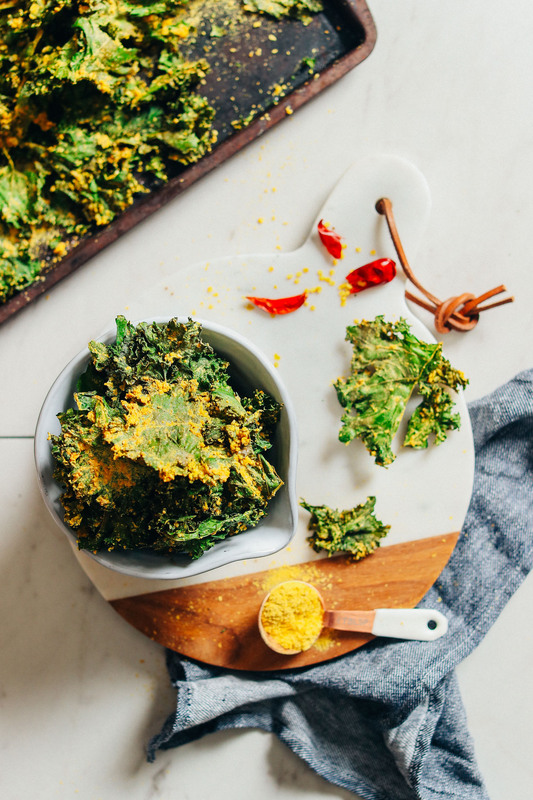 I would definitely try your sunflower coated kale chips. Well, I have a question, if I want to avoid yeast, is there any substitute that you can suggest? Thanks in advance. It’s pretty essential to the flavor and texture here. But if you try and omit it let me know how it goes! Thanks for your quick response Dana. I’ll be in touch. Pretty sure that should work! Let me know if you give it a try. I just bought my first bag of nutritional yeast, thanks in part to inspiration from your blog! I can’t wait to try it with this recipe! Could I do these raw in a dehyrdator like the Laura Miller kale chips? Totally! I just don’t have a dehydrator. xo! These look great. Is the 670g of Kale before or after the stems are removed? I can only find chopped kale near me and I’ve found the stems can be half the weight of the bag and it can really throw out the ratio of kale to coating, if you see what I mean. I chop mine with the stems and only discard the large stubby ends – the grams are an estimate without large stalks, but with small stems. Could I make these without the nutritional yeast? I don’t have any on hand at the moment. Definitely going to try this with cashews! I’m sure you could, but it will definitely affect the flavor and texture. If you give it a try let me know! Thank you so much for giving out amazing and delicious recipes! I am so excited to make these and I really appreciate your work to share healthy food with us. Whoop! Hope you love this one. xoxo!